Palmer, MA - A beautiful town that has so many things to do within the surrounding area. One of the most sought after services in Palmer are those of a quality siding contractor. Many homeowners in Palmer are looking for their home siding to be replaced and here is a prime example of one of the projects we have done in the local area. 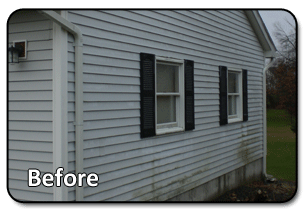 These homeowners previously had old and flimsy vinyl siding that would easily tear off with a strong windstorm. They explored all siding options, including new vinyl siding and fiber cement siding, but ultimately chose Everlast Composite Siding for its incredibly low maintenance and durability. The color chosen for this project was Spanish Moss and the size of the clapboard was 7-inches. The entire home went through a complete and thorough inspection for any potential rot and new Everwrap mositure barrier was installed. All of the trim was replaced with 6" Super Corner boards and the window frames were replaced with white PVC trim. The end result was spectacular and the homeowners could not have been more excited for the new and revamped look of their home. 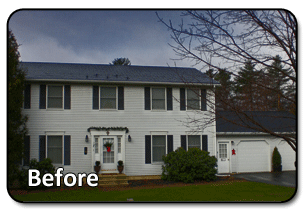 These Palmer, MA residents get compliments all the time from their neighbors that love the appeal of the home.